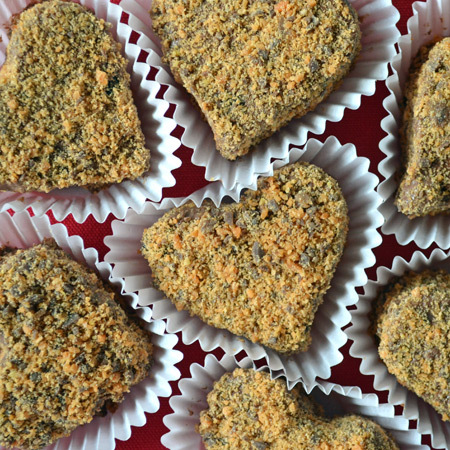 Here’s another easy, make-ahead dessert for Valentine’s Day (or any day, really). 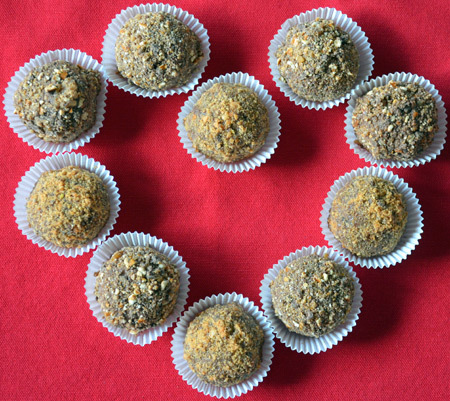 Combine your sweetie’s favorite ice cream with their favorite candy bar and serve up some customized ice cream truffles. Line 2 baking sheets with parchment or foil. Freeze for 10 minutes. Remove one sheet. Using a melon baller or ice cream scoop, scoop the ice cream and place individual balls on baking sheet. Return sheet to freezer. Repeat this process with second sheet. Freeze the balls for 30 minutes, or until firm. Place the chopped candy on a small plate. (Use multiple plates for multiple candies.) Working with 1 baking sheet at a time, roll the ice cream balls in the toppings, using your hands to gently press in the toppings. Freeze for 30 minutes before serving. For longer storage, place in a freezer bag or airtight container and freeze. Allow ice cream to soften on the countertop until it has a spreadable consistency (or microwave on low until spreadable). Line an 8 x 8-inch baking pan with parchment or foil. Place ice cream in baking pan, smooth top, and cover with plastic wrap. Freeze for 6o minutes, or until firm. Remove ice cream from freezer. Remove plastic wrap. Invert over a cutting board and peel away parchment or foil. 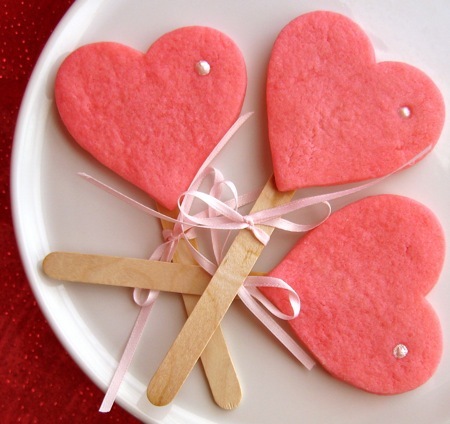 Using a heart-shaped cookie cutter (mine was 2 1/2 inches wide at its widest point), cut heart shapes and place hearts on baking sheet. Return sheet to freezer. Repeat process with second baking sheet. 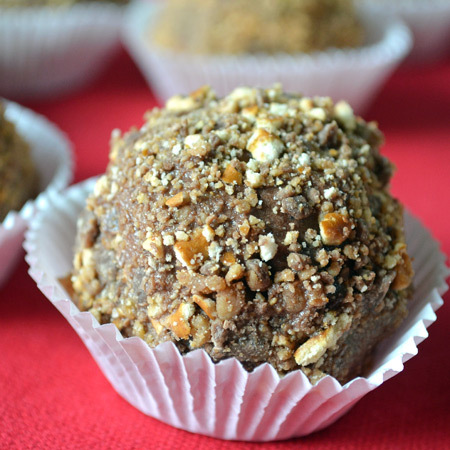 If desired, scoop ice cream scraps into balls and place on baking sheet as well. Freeze for 30 minutes, or until firm. Place the chopped candy on a small plate. (Use multiple plates for multiple candies.) Working with 1 baking sheet at a time, gently roll the hearts (and balls, if you scooped the scraps) in the toppings, using your hands to gently press in the toppings. Freeze for 30 minutes before serving. For longer storage, place in a freezer bag or airtight container and freeze. This is one of those recipes (though it’s barely a recipe, I’ll admit!) that really can’t go wrong as long as you start with delicious ingredients. Plus, I love that the work is already done and these truffles will taste just as good after dinner on Tuesday as they did the day I made them. Happy (early) Valentine’s Day, everyone! TIPS: I suspect that drier candy bars (like the ones I used, or Heath, Toblerone, etc.) work best with this recipe because they won’t bond into lumps due to an excess of caramel, peanut butter, or other delicious ooey-gooey elements. If you try a gooey candy bar with these, though, let me know how it goes. Also, I initially intended to make mini heart truffles, but my mini heart cutter was too shallow to cut through the ice cream in the 8 x 8-inch block. If you want to make minis, put the ice cream in a 9 x 13-inch pan instead. Erica of Erica’s Edibles was our host for the Daring Bakers’ June challenge. Erica challenged us to be truly DARING by making homemade phyllo dough and then to use that homemade dough to make baklava. I doubled the dough recipe (as recommended) and let it rest for 2 hours before rolling it. The wrap-the-dough-around-the-dowel technique didn’t work for me, perhaps because my rolling pin is thicker and is silicone (not wood). My dough just fused together into a tube instead of growing larger. I just kept moving and flipping my dough, rolling it from every direction, until it was as thin as I could get it. Then, as recommended, I stretched it even more with my hands. I was pleasantly surprised by how well the dough held up for handling despite being rolled so thin. Even though I definitely got my dough sheets to the point of transparency, I only ended up with 11 or 12 sheets. 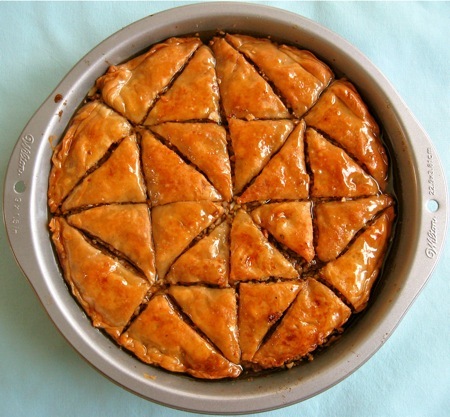 Since they weren’t huge and I didn’t end up with quite as many of them as I hoped I would, I decided to use a 9-inch round cake pan instead of a 9 x 9-inch square pan for my baklava. I thought I floured well between each sheet, but I apparently didn’t do it well enough; my sheets stuck together pretty badly when I was trying to pull them off to assemble the baklava. I did my best to make sure I separated all the sheets, but one or two layers might have been doubled. I had set one perfect sheet aside on the counter under some plastic wrap for the top, though, so I don’t think anyone would really be able to tell that I struggled. I used the recommended nut combination for my filling (almonds, walnuts, and pistachios) and the recommended spices (cinnamon and allspice). I think I overdid the clove a bit in my syrup. I used an entire stick of butter for buttering between the phyllo layers. The recommended baking time was 60 minutes at 350°F, but mine was a deep golden brown at 45, so I took my pan out of the oven at that point. Since I used a 9-inch round cake pan (6-cup capacity) instead of a 9 x 9-inch square pan (8-cup capacity), I made 3/4 recipes of the filling and the syrup. The filling was just right, but I think there was a bit too much syrup; I should have followed my instinct and left a bit out. 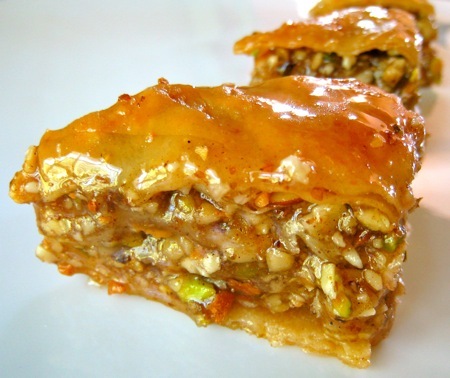 Even after resting for 16 hours, my baklava was still oozing a bit, though the majority of the syrup did get absorbed. In my opinion, the syrup is a bit too sweet. 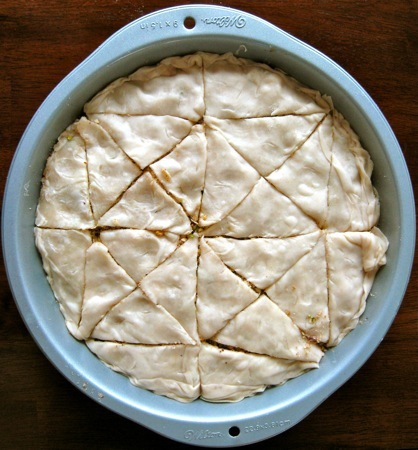 If I ever make it again (with store-bought phyllo, sorry! 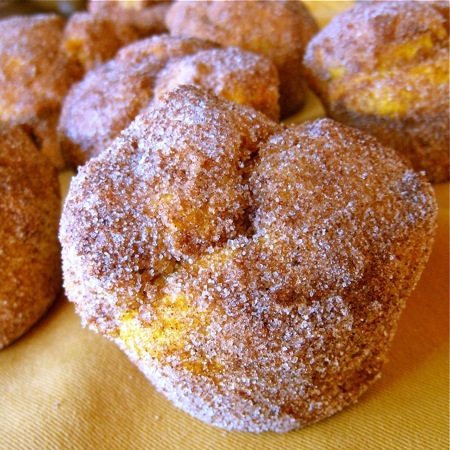 ), I’ll cut the sugar to 1/2 cup (for a full recipe) instead of 2/3 cup. After the initial cuts (before baking, in the middle of baking, and post-syrup), I continued to cut through my baklava periodically as it cooled. It came out of the pan very easily this morning. Thanks for a great challenge, Erica! How do I love thee, peanut butter? Next to apple slices, tucked inside a chocolate cup, sandwiched with homemade jam, and now, in waffles. As someone who consumes peanut butter almost daily, I saw this recipe in the May 2011 issue of Everyday Food and couldn’t resist. The recipe isn’t on Martha Stewart’s site yet, so I’ve posted it for you. I was able to get 20 small heart-shaped waffles out of the batter. 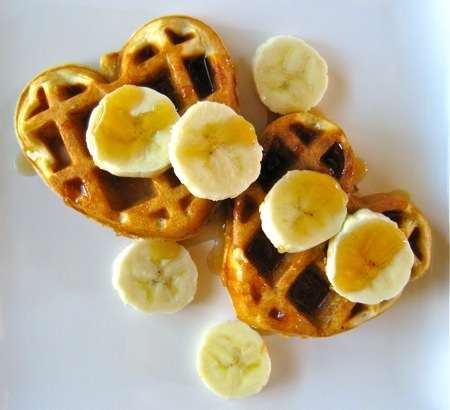 Two waffles (before you add bananas and syrup) are 6 Weight Watchers PointsPlus points. Heat waffle iron and preheat oven to 275°F; set a wire rack in a rimmed baking sheet and place in oven. 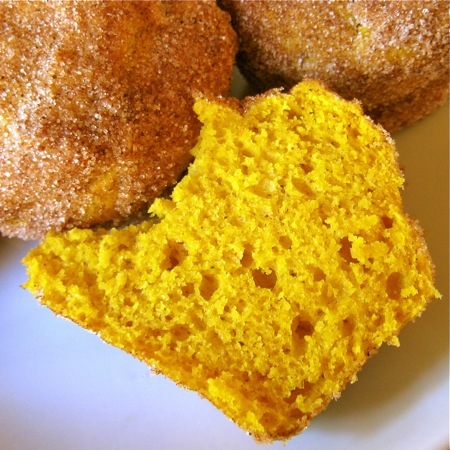 In a large bowl, whisk together flour, sugar, baking powder, baking soda, and salt. In a blender, blend butter and peanut butter until smooth, 1 minute. Add buttermilk and eggs and blend until combined, 1 minute. Add buttermilk mixture to flour mixture and stir just until batter is combined. Brush waffle iron with butter and pour in 1/2 to 3/4 cup batter, leaving a 1/2-inch border on all sides. Close iron and cook until waffles are golden brown, 2 to 4 minutes. Transfer waffles to rack in oven to keep warm; repeat with remaining batter. Serve with bananas and maple syrup. Note: Waffles can be frozen in zip-top bags, up to 1 month; reheat in the toaster or a 325°F oven. I’m not sure I’ve ever had a bad waffle, but these are tastier than most. They have a subtle peanut butter flavor when eaten plain; I think the bananas and syrup bring out the peanut butter a bit more. In terms of texture, they’re pretty light and fluffy. The oven time crisps the outside edge a bit (a plus in my book!). Since I am always looking for good make-ahead recipes to take the stress out of entertaining (or even just getting Dr. O out the door in the morning), I love that I can make a whole batch and either hold them in the oven or freeze them for later. These aren’t going to dethrone my favorite classic waffle recipe, but they are certainly delicious and a nice change of pace. Give them a try! Who says cream cheese mints are only for weddings? I came across the recipe for Barrington Mints as I was paging through my copy of The Rocky Mountain Sweet Shoppe Cookbook a few weeks ago. I’ve only ever sampled cream cheese mints on Midwestern wedding dessert tables, but they seemed easy and festive enough to fit the Christmas bill. Despite a mild misadventure (I’ll tell you after the recipe!) and an extreme piping strength requirement, I was pretty pleased with the results. Melt the cream cheese with the butter in a heavy 3-quart saucepan over low heat, stirring constantly with a wooden spoon. Turn off the heat, leaving the pan on the burner, and stir in about 1 1/2 cups powdered sugar, food coloring, and vanilla. (My note: Add peppermint here as well.) Stir in the rest of the sugar until well blended. Line a large baking sheet with wax paper. Push mint mixture into a pastry bag, icing syringe or squeeze bottle with a decorative tip. 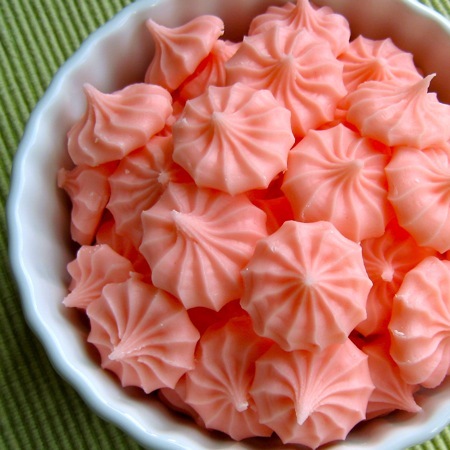 Create desired shapes for mints. Let set 1 hour. Store between sheets of wax paper in an airtight container in the refrigerator for up to 1 month, or in the freezer up to 4 months. Do not store at room temperature. Aren’t they pretty? They taste just like other cream cheese mints I’ve tried: sweet, minty, and melt-in-your-mouth creamy. Despite Dr. O’s raging sweet tooth, we are never going to get through this many mints; thankfully, we have a few dinner guests coming later this month who might be willing to help. As for the misadventure, I had piped 20 or 30 mints when I realized that I hadn’t added the peppermint extract. I just realized (as I was typing this post), that what seemed like a spacey mistake was probably actually the result of the fact that they don’t specifically mention adding the peppermint in the recipe instructions. Whoops. Anyway, I just tossed my mixture back in the pot, turned the heat on medium-low, added the peppermint extract, and then stirred the mixture for a minute or two until I was confident that it was pretty evenly incorporated. Problem solved. It’s also worth noting that I had to let these set in the refrigerator (not on the counter) so they would firm up enough to hold their shape when I pulled them off of the wax paper. Since they get softer the longer they sit at room temperature, I would probably put a plate of these out when I serve dessert rather than have them sit on a buffet for hours. 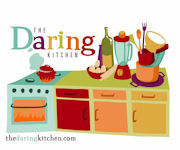 The August 2010 Daring Bakers’ challenge was hosted by Elissa of 17 and Baking. For the first time, The Daring Bakers partnered with Sugar High Fridays for a co-event and Elissa was the gracious hostess of both. Using the theme of beurre noisette, or browned butter, Elissa chose to challenge Daring Bakers to make a pound cake to be used in either a Baked Alaska or in Ice Cream Petit Fours. The sources for Elissa’s challenge were Gourmet magazine and David Lebovitz’s The Perfect Scoop. 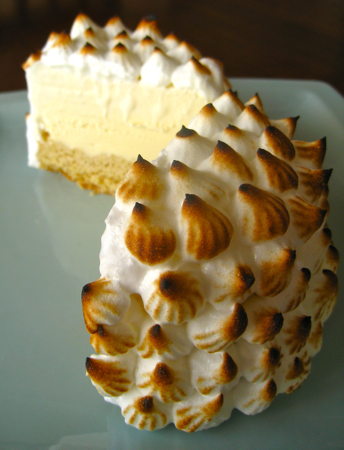 Baked Alaska is a dessert that has been on my “must try” list for some time now, so I had to go in that direction with this challenge. Brown Butter Pound Cake: There is nothing like the smell of brown butter! Good heavens. I don’t think I’ve worked with it since my very first Daring Bakers’ challenge back in November 2008 (Caramel Cake with Caramelized Butter Frosting), and now I want to put it in everything. When I was browning the butter, my splatter screen sure came in handy because the mixture spurted quite a bit. Also, I really did need to keep an eye on it because my milk solids were the desired chocolate brown when the foam on top started turning a golden brown. I couldn’t see the solids beneath the foam, though, so I’m glad I pushed it aside to check before the butter burned. I didn’t modify the cake recipe for altitude (I usually try things as is on the first attempt), so I knew I probably wouldn’t get perfect results. My cake needed 28 minutes (instead of 25) and it ended up with a sunken center, but I just used my cake leveler to take off the top so I would have nice, even bases for the Baked Alaska. In terms of flavor and texture, the cake was outstanding. It was moist, very buttery, slightly nutty, and not overly sweet. The crumb was perfect. I enjoyed it so much that it would be worth the work of tweaking it for altitude. Vanilla Ice Cream: I know, I know, this is the part of the recipe that practically begs for a creative injection. I like vanilla ice cream, though. And I really like this recipe, so I’m awfully glad I tried it in its purest form. The only challenge I had in this part is that I opened my vanilla bean jar to find my last remaining vanilla bean had dried to a crisp. Boo. So despite my best vanilla bean intentions, I had to add the 3 teaspoons of vanilla extract indicated for those of us without vanilla beans. Also, based on my experience with several other ice cream recipes, I only chilled the milk/egg/cream mixture in the refrigerator for an hour (not overnight) before freezing it in my ice cream maker. Everything turned out great! This ice cream is so amazingly creamy, vanilla-y, and delicious that I’m lucky the Baked Alaska portions even made it to the freezer. Meringue: Everything went according to plan here. The only “problem” is that the recipe made over twice as much as I needed to cover the outside of my four desserts. Assembly: I used a Wilton 3 1/2-inch cookie cutter to cut my cake bases; I was able to get 4 bases out of the cake. I used 1/2-cup ramekins (instead of tea cups) lined with plastic wrap for the ice cream toppers. When it was time to pipe the meringue, I tried to be somewhat original and do mine in a continuous outside swirl (like a beehive); even with my rotating cake stand, it was hopeless. The star tip method (shown in my photos) worked so much better. 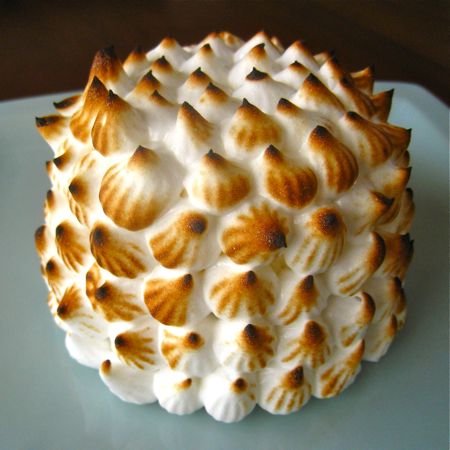 I used my kitchen torch to brown the meringue. I absolutely loved this dessert! The ice cream was beyond incredible and I loved the toasty, marshmallow-y flavor of the meringue. The cake flavor didn’t come through as well once it was frozen, but I didn’t think it was dry like some of the other Daring Bakers did. Each portion was seriously gigantic and built for sharing… My husband has an endless appetite, and even he eyed an individual portion nervously and said it looked “filling.” If you were going to serve these to guests (this is a perfect entertaining dessert since it’s meant to be frozen ahead), you could get away with one dessert for every two to four guests. Thanks for an amazing challenge, Elissa! You’ve given me my new go-to vanilla ice cream recipe and I’ll definitely try making Baked Alaska again (perhaps with chocolate cake next time? ).